I am absolutely delighted to have received a reference citation from Gary Allen in his new book, Sauces Reconsidered. Allen cites my history of Crosse & Blackwell. I am glad that he found it helpful. 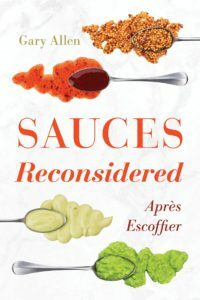 Sauces Reconsidered is very good, and if you have found my posts on sauces and foods interesting then I can highly recommend his book for further reading. Allen has previously contributed to the Oxford Encyclopedia of Food and Drink in America. He is highly knowledgeable about food. You can explore his blog here. Via the magic of Google Analytics, I bring you the top ten pages on letslookagain.com. Obviously bear in mind this ranking will by its very nature favour posts that have been on the site for the longest length of time. Smith’s crisps, also with reference to Walkers and Golden Wonder. Goodall, Backhouse & Co, the Yorkshire Relish producers. Keiller marmalade. People are often most curious about brands that have disappeared in the recent past. It’s a question often asked, which came first, Lifesavers or the Polo mint? What led me to create letslookagain.com? I assumed these were questions that naturally everyone would be asking, but it turned out it was rather a niche interest. Yes, dear reader, I was interested in brands and companies. Nobody I knew could really answer these questions, and this was the days before widespread internet access! I could turn to books, but my questions were really ones best answered in academic studies. The number of British universities with substantial business history departments (and correspondingly well-stocked libraries of business history) is surprisingly few. Academic journals and books online would help massively in later years, but until then I instead turned to regular history, which was of course much easier to get my hands on. Someone recommended that I read Niall Ferguson’s Empire (2003), a history of the British Empire. How did a small island nation off the North West of the European continent come to rule over a quarter of the global population? Ferguson helped to answer that question, but he also demonstrated that not only was approaching history from an economic perspective well worth doing, but that it could be engaging and readable too. I was encouraged by the example set by public intellectuals such as Adam Curtis and Malcolm Gladwell, individuals who sated that hunger for knowledge about the world, whilst in doing so fostered a sense of fun, discovery and playfulness. Curtis chronicled advertising and brand management in The Century of the Self (2002), and Gladwell’s 2004 essay, ‘The Ketchup Conundrum‘, explored how Heinz developed the leading tomato ketchup in the world. Curtis and Gladwell demonstrated that such stereotypically dry subject matter could engage people. They were also unafraid to challenge the “established consensus” on various matters. When access to the internet became an option, I was able to satisfy my curiosity about business history. Official company websites often lacked a history section, or if they did it lacked depth, or it was outrageously biased, or it was demonstrably incorrect. Wikipedia and Grace’s Guides were two helpful references, but they had glaring gaps in their coverage, and often hosted inaccuracies. A found a beacon of historical veracity through the blogs of Martyn Cornell and Ron Pattinson. With a focus on the history of brewing, Cornell and Pattinson are brilliant at returning to the primary sources, and in doing so demonstrate that many published historical claims are inaccurate. I was initially amazed at how much “established consensus” they were able to refute with relative ease. I worked as an editor on Wikipedia, but eventually grew frustrated by the lack of control over my own work. Thus, I decided to create a blog of my own. Beer and brewing seemed to me to be a subject that already enjoyed quite strong coverage, so I instead gravitated towards a focus on food and drink. I have subsequently broadened my reach to include articles on all sorts of companies, although consumer goods remains the main remit.